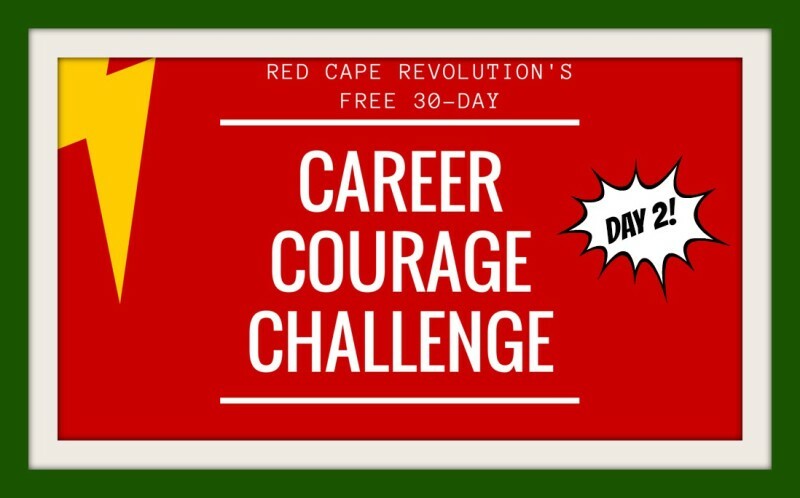 Welcome to Day 2 of our 30-Day Career Courage Challenge! Each day, I’ll be sharing a short challenge you can take to help build your courage and your career. Plus, I’ll be taking the challenges along with you—watch for my notes in the Comments, below, as well as on Facebook and LinkedIn, so chime in! YOUR CHALLENGE TODAY: Stop and look around. Who’s in your life at work right now who you admire or aspire to be more like? What makes them great? Is it their positive attitude? Their ability to handle conflict without getting twisted in knots? Or something else? Here’s your opportunity to do more than just notice. Today’s Career Courage Challenge is to State What Makes Them Great. Brave modesty or embarrassment and speak up. It takes focus and kind attention to really recognize what is wonderful in others, rather than just nodding and looking the other way. Bonus points if you actually TELL someone–including the person you think is great! Don’t forget to share your experience with today’s Challenge in the Comments below! Know someone who should take the challenge, too? Point them to CareerCourageChallenge.com to sign up and get each day’s challenges in their inbox! Okay, here’s mine. I work with an amazing executive assistant, Ashley Bambarger. What makes her great is that she handles my complicated schedule (and last-minute changes) with grace and ease. I know I’m not always as organized or as clear as I’d like to be, and Ashley always digs just a little deeper to make sure we’re in sync and that whatever we’re doing is the best use of our time and energy. I appreciate her contributions to my work and my life! She’s great! What makes someone in your life at work great? Your turn! I work with the amazing Dr. Kathleen Phillips. We are yin and yang to each other — I’m great at coming up with ideas or different perspectives on things, and she is fantastic at the ticky-tacky details of implementation and evaluation. My professional life would be MUCH more difficult without her, and I’m going to chain her to her chair, and never let her retire! Thanks, Julie, and kudos to Dr. Phillips, who obviously is an amazing person! Thanks for stating what makes her great–you rock! Wow! There are so many people who I think are great! There’s Cecelia Johnson who has been in my corner from day one and is always there to lend an ear or a shoulder to cry on if need be. Then there’s Ericka Gwyn who is just an organizational Dynamo and is currently keeping me from pulling out all my hair. There’s also Ouida Burke one of our front office secretaries who provides customer service that is second to none! Thanks for sharing these great people, Chantrise! I hope Cecelia, Ericka, and Ouida always know how special they are to you! Thanks for taking our challenge! My friend is a consummate networker and is capable to making time to strategically work the backside of the work effort to gain the support for an effort that is not going to be popular. It is my kryptonite and I am trying to learn this skill, which is why I admire my friend so much for his ability to do this; it is his strength. It just so happens that I recently told him that, too.